Lincoln has seen countless eateries, diners, cafes, bistros, buffets, chophouses, cafeterias, coffee shops, ice cream parlors, drive-thrus, etc., come and go. Here's the final part of a look back at Lincoln's culinary history. 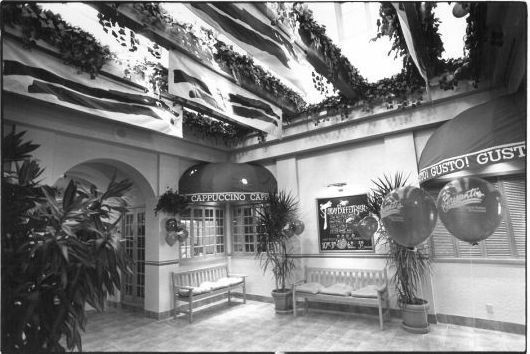 The original sky-lit entryway of Grisanti's in 1987. 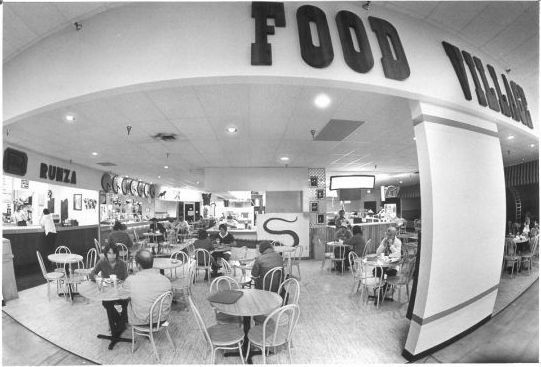 Food Village had something for everyone at East Park Plaza in 1981. Owner Scott Wiegert stands outside the Club Car Grill & Bar, formerly a Chartroose Caboose, in 1987. OK, this one isn't in Lincoln, but look at all that beef! Bob Branson selects the choicest cuts from the original walk-in cooler at Dreisbach's in Grand Island in 1982. Diners appear to be sitting on a veranda in ancient Greece at the newly renovated Terrace Grille in the Cornhusker Hotel in 1995. Lisa McDonald (left) and Stephanie Hay help a customer at I Can't Believe It's Yogurt at 14th and O streets in 1991. Eddy's at 48th and O streets had seen better days before it was demolished in 1984. Partners Laura Halterman (left) and Octavia McPhail stand outside their new Mexican restaurant at 1228 P St. in 1987. Joan Biasucci mans the helm of the Captain's Quarters at Anna's Restaurant in Cedar Creek in 1991. The bar at Brittany's, formerly the Lincoln Underground, once graced the former Hob Nob Pub. Pictured in 1983. Owners Sherl Jensen (left), Eldonna Hazen and MaryAnn Mellor stand in their second HMS Brown Baggers location in 1989. Hip new coffeehouse The Fisherman's Shoe opened at 16th and O streets in 1969. From the original caption: "A youth who works there describes it as 'a place to go other than the straight places.' It's name derives from Peter, Jesus' disciple. One youth said: 'Peter was a cool cat. Jesus was always on his back. He -- like us -- couldn't do anything right, but he was okay.'" This 1973 photo was filed without a name. Does it look familiar to you? Road work in 1979 forced the temporary shutdown of Grampy's Pancake House. Sandy Hays and Juli Durst prep for the lunch rush at 1st Avenue in 1990. So many restaurants have come and gone throughout Lincoln's history, including The Bistro, which closed its doors on Sept. 26, 1991, after 10 years in business. It's been a good run, but this concludes our look back on Lincoln's culinary history. Until next time, Bon Appétit. See if your favorite pooch made the American Kennel Club's 10 most popular dog breeds in 2014. Another sandwich chain has plans to open its first Lincoln location.